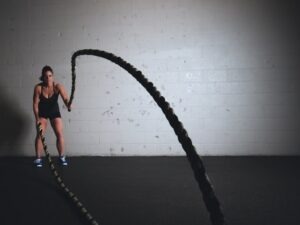 This article is a great read outlining the findings across a broad range of research and literature, surrounding the effects of HIIT training on the body. The World Health Organisation (WHO) recommends at least 150 min of moderate-intensity physical activity (40–60% of an individuals’ VO2 max)3) or 75 min of vigorous-intensity physical activity (60–85% VO2 max) per week for healthy adults to maintain or improve health. A big barrier to this is participation or time constraints for most adults. High Intensity Interval Training (or HIIT) is an aerobic form of exercise that requires less time to participate than traditional “cardio” exercises. HIIT generally involves a short period of intense effort followed by a period of active rest. HIIT exercise comes in all forms, from group classes, cycling, running or swimming programs. • High-intensity interval training (HIIT) performed at least 3 times a week for 12 weeks results in significant, positive, physiological adaptations that improve cardiometabolic health in overweight/obese populations. • HIIT may reduce the development and progression of disease-related risk factors that are associated with overweight/obesity and low aerobic fitness. • HIIT may be especially attractive to populations interested in improving cardiometabolic health but with limited time available. An important aspect to note is that it is not recommended to go from doing no exercise at all, to starting a HIIT training program, as this may predispose individuals to injury via a lack of conditioning. At MD Health, we assess each individual before commencing a HIIT program. We offer HIIT sessions such as Boxing, Cycling and Triathlon sessions. The current review clarifies the cardiometabolic health effects of high-intensity interval training (HIIT) in adults. One of the primary advantages of HIIT, compared to lesser-intensity exercise, is that HIIT requires less time be spent exercising, while providing similar or greater health-related benefits, compared to established physical activity recommendations. As a result, it has been theorised that HIIT can mitigate the most commonly cited barrier to physical activity which is ‘lack of time’.